ADTRAN provides a full line of powerful, business-class ethernet switching solutions for all your network needs. Perfect for SMB and multi-site enterprise networks, NetVanta Ethernet switches address today’s networking priorities from bandwidth expansion and VoIP migration, to network security and wireless LANs. 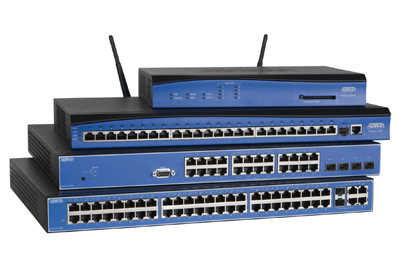 This line includes managed Fast Ethernet, PoE, and Gigabit switches, as well as innovative Layer 2/Layer 3 multiservice and fixed-port routers with integrated switch ports.